ANOTHER NEW LAKE RECORD FOR TEAM CATFISH! 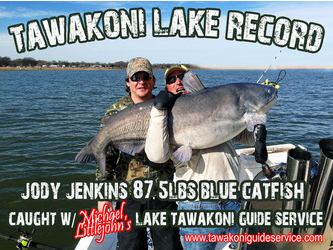 My customer J. Jenkins from near the Texas/Oklahoma border fought and landed which is now the official ALL-TACKLE Lake Tawakoni Blue Catfish Record. The fish weighed 87.5lbs and was and absolute incredible fish. Jody did an excellent job fighting the fish. Luckily, the entire fight was caught on HD video and sometime when we slow down and I will get it edited and post in on YouTube. Pretty cool to catch the lake record…even cooler to catch it on video. The fish hit a small shad fillet on a 8/0 Team Catfish Double Action hook. All my rods are rigged w/ 25 and 30lb Electric Lime mono from Team Catfish. I cannot say enough good things about Team Catifish’s products. We fish 7 days a week and their gear has held up extremely well. As excited as we are about this fish, I just don’t see it standing up very long. I’m hoping some youngster breaks it soon! The monster fish was released to fight another day. And, it was the original fry put in the lake back in ’89 per TP&W. Good times & Good fishing. Michael and Teri at Tawakoni Guide Service can put you on the bigguns! Go see them. This entry was posted in Team Catfish and tagged tawakoni catfishing on March 12, 2014 by Jeff Williams.